The Idea of externalizing Labour in developing countries was born as a result of high levels of unemployment, especially the employable unemployed youth, in their home countries. Under pressure to create jobs for their unemployed people, Governments or individuals in less developed countries started looking for employment opportunities abroad. Whether in developed or developing countries like Uganda, it is a known fact that remittances from externalized labour have over the years contributed a lot to poverty reduction. Over time, realizing the economic benefit from externalizing labour of their employable citizens who are unemployed in their home countries, the Government of Uganda saw sense in putting in place an enabling regulatory environment, through which we legally externalise our unemployed and underemployed Ugandans. It is as a result of this common sense realization that the establishment of External Employment Unit was effected. The Externalisationof labour was formalized when the External Employment Unit was created in the Ministry of Gender Labour and Social Development responsible for Labour by Statutory Instrument No. 62 of 2005, The Employment (Recruitment of Ugandan Migrant Workers Abroad) to enhance coordination, Regulation, licensing of private Recruitment Agencies and facilitating access to job opportunities abroad. As a result of this policy, labour externalization is organized and streamlined which makes Uganda able to compete favorably in the international job market, and to protect Ugandans who exit officially for employment abroad. 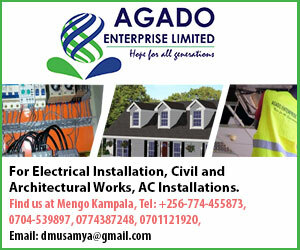 Externalisation of labour is promoted in line with ILO standards as an interim measure to facilitate able bodied Ugandans to tap into the job market abroad as the country develops its capacity to generate sufficient jobs for its labour force. Economic emancipation and Wealth creation. Acquisition of Skills and experience. Exposure and establishment of business contacts. Moblilisation of Capital for Investment. In our case, Uganda Association of External Recruitment Agencies (UAERA) was established in 2013, and has a membership of 110 (One hundred Ten) companies. To unite and offer a common platform to all companies licensed under the labour externalization programme to operate under one umbrella, share information, improve cooperation with Partners/ Stakeholders in the promotion of safe, legal and gainful Employment abroad. To ensure protection of Ugandan externalised workers, observation of their human rights and welfare, in accordance with the international labour standards and laws. To self-regulate, ensure adherence to the code of conduct, laws, regulations and guidelines set by the Ministry of Gender Labour and Social Development. Advocacy for Uganda Association of External Recruitment Agencies(UAERA), Publicity, Sensitization of the public to make the sector understood and sustainable. For general recruitment, age is 21- 35years and for Professionals 24 – 45years. Jobs are openly advertised and only candidates with recommendations from Local Council (LC), District Internal Security Organisation(DISO) and Residence District Commissioners (RDCS) are shortlisted. They are then vetted by Interpol and Internal Security Organisation(ISO) in order to get Candidates with a clean record. After clearances have been obtained, applications are forwarded online through licensed companies and approvals are done by the Ministry of Gender, Labour and Social Development online. Employers interview candidates either physically or via Skype. Successful candidates are selected, they sign employment contracts, undergo medical tests and prepare to travel. Visas are sent by employers to recruitment companies by e-mail. In case of theKingdom of Saudi Arabia, companies Enjaz (confirm visa issuance) the candidates, Passports are presented to the Embassy, visas are endorsed. Air tickets are procured by companies and candidates then travel to the countries of their destination. Catering and Hospitality Personnel. ETC. Required qualifications depend on the job category. War zones: Iraq, Afghanistan, Somalia. Candidates recruited for war zones are not required to pay for placement costs. The bills are paid by Employers. Uganda has Bilateral Labour Agreements with the two Countries indicated above. Male workers get free visas and Air tickets. They pay for local requirements e.g Passports, training, medical tests, Interpol, yellow fever vaccination. Maximum amount required would not exceed shs 2,000,000 (Uganda Shillings two million only). Female candidates destined for Jordan or Saudi Arabia arenot required to pay any amount of money. The Employment Companies in the destination Countries pay for all placement costs. United Arab Emirates (UAE), Bahrain, Qatar, Oman and Kuwait. Most jobs to these Countries are secured through Employment Agencies, based mainly in Dubai. The Agents determine the cost of the job. The cost varies from approximately US $ 800 (US Dollars eight hundred) to US $ 2,000 (US Dollars two thousand only) depending on job category, country salary and required amount of agent fees. In most cases, Agent fees account for 50 to 60% of the total cost. The Salary range depends on qualification and experience in the relevant field. All workers are provided with accommodation, transportation to and from work and medical insurance as provided for by Law. 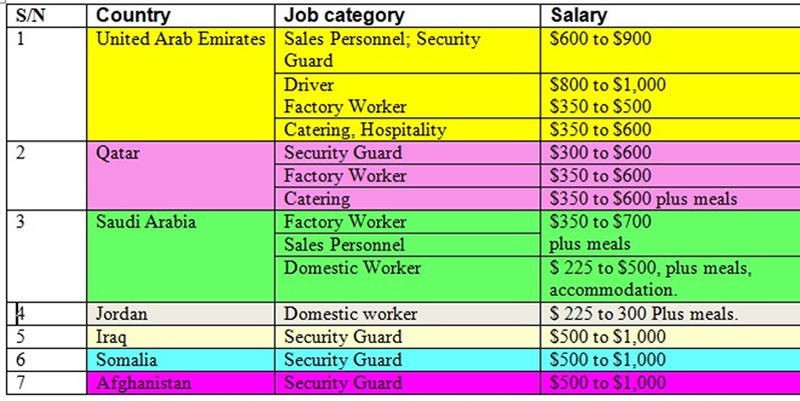 The detailed salary ranges are provided in Table 1. They earn between $1,000 to $6,000, depending on the category e.g. Restaurant managers earn $2,000 to $5,000; IT specialists earn $1,500 to $5,000, etc. 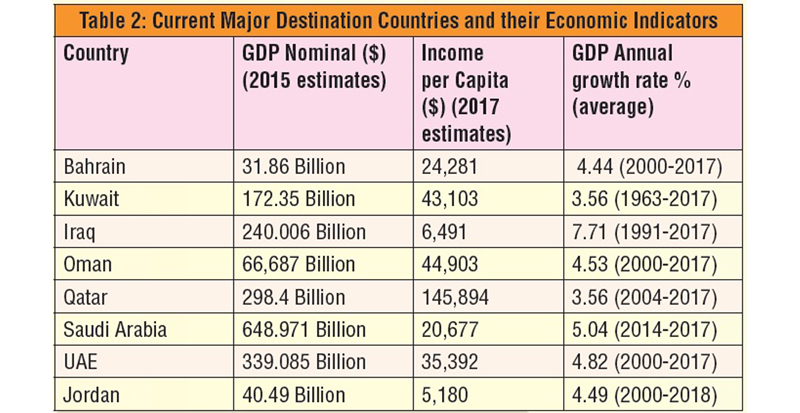 The major destination countries (Table 2) are in the Middle East. These are countries where the Economies are growing sustainably compared to East Africa’s Economies (Table 4) and therefore, creating jobs. Furthermore, these countries have Laws, Policies and structures that attract and sustain migrant employees. Other destinations include Iraq, Afghanistan and Somalia among others. Thirteen Billion, worldwide. Currently, we have over 140,000 (One HundredForty thousand) Ugandans , working in the Middle East. Over US $ 500,000,000 (Dollars Five Hundred Million) is remitted Annually by these migrant workers. US$ 870,000,000 (Dollars Eight Hundred SeventyMillion) is remitted to Uganda Annually from other parts of the world. 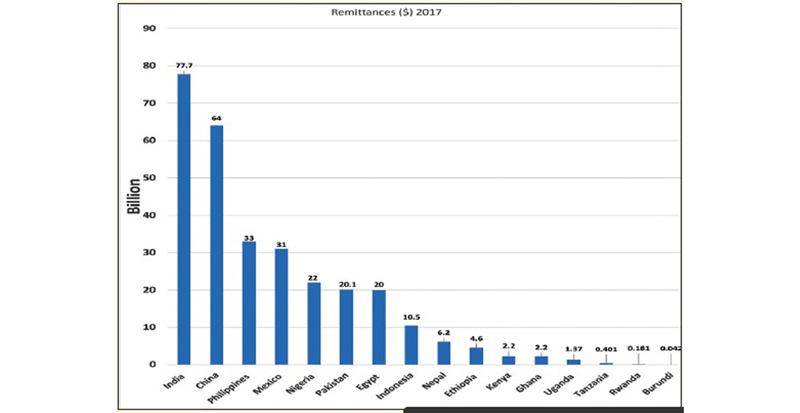 This accounts for US $ 1,370,000,000 (Dollars One Billion, Three hundred Seventy Million) of remittances from all over the world to Uganda (Table 5) – A substantial contribution to our Economy. The number of Migrant workers ranges between 30% to 80% of the total population in a given Country. Workers are employed on 2 years contracts or 3 in some cases of skilled labour. Research has shown that 35% of employees work for one term contract, (25%) renew and complete 2 term contracts, 15% renew their contracts 3 times and work for 6 years, and 10% above 6 years, 5% return before end of first contract. Reasons for their early return range from social demands e.g. marriage, change of mind or failure to acclimatize. Replacement of workers is therefore a continuous process. The demand is continuous and elastic as the Population and Economies continue to grow, as indicated in tables above and below. If we take the average Salary of the Ugandan Domestic worker at shs.100, 000, per Month, in one year (12 months) it comes to 1,200,000 (Shillings One Million Two hundred thousand only) whereas the same worker in the Middle East earns a minimum of Shs.850,000, per moth, in the same year will make 10,200,000, (Shillings Ten Million Two hundred thousand). See table below. 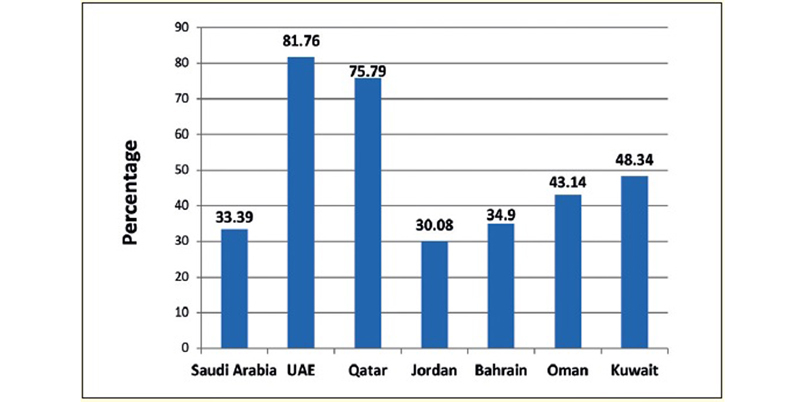 Income earned in the Middle East is net. In addition, the worker in the Middle East has a number of benefits provided under the law that include free accommodation, free food and medical Insurance and bonuses. When these benefits are converted into cash then the figure triples. The availability of domestic work with a minimum wage, has transformed lives of many Ugandans who had no hope of getting out of their miserable, poor conditions. They are now able to save, invest in Businesses and acquire Property.There are no Academic requirements for this Category of employees apart from ability to communicate in basic English. Approximately 140,000, (One Hundred Forty Thousand)Ugandans are currently deployed in the Middle East. If it was not for this window of opportunity to work abroad, some of them would be involved in Crime, Prostitution and Drugs. Domestic workers are approximately 30% of all Migrant employees in the Middle East. Uganda Association for External Recruitment Agencies’ cardinal objective therefore, is to keep/get these youth off the streets, train and put them into productive employment through which they are able to contribute to National development. Looking at the demand mentioned above, countries with high levels of unemployment, find justification to continue Externalizing labour while streamlining processes to improve monitoring and protection of the workers. Research has proved that countries that have tried to impose restrictions on the movement of migrant workers have ended up with more of their people being trafficked ending up in risky miserable situations. Royal Kingdom of Saudi Arabia. Between Jan-2016 and Jul-2017 Uganda imposed a Ban on externalization of domestic workers. During the same period 30,000, ( Thirty thousand) Ugandan ladies were either trafficked or left on their own to Oman and others to other destinations. The ban was there for counter-productive. Currently Oman is not an authorized destination of Ugandan female domestic workers. Ugandan male workers and female professionals are permitted to work anywhere in the world as long as there is proof of availability of genuine employment. Measures And Laws put in place by the Government of the kingdom of Saudi Arabia in the last 2 years, to enhance protection of workers’ rights. Introduction ofMusaned: An online monitoringsystem that is used to manage the Recruitment process. A four-party standard Employment Contract whichis signed by employer, employee, Source Company and destination Company. Establishment of labour dispute and settlement centers in Several cities of Saudi Arabia, manned by Judges. Putting in place hefty penalties for employers who violet employee’s human rights. Establishment of a human rights department at the domestic center of the ministry of labour in the Kingdom of Saudi Arabia. Establishment of call centers to respond to labour complaints. Establishment of Reception centers with medical facilities in major cities to cater for workers who may be destressed, stranded or unwell. Compulsory provision of mobile phones to workers. Provision of return air tickets by the government of Saudi Arabia to returning workers who may find challenges and are compelled to leave the country. Compulsory opening of accounts for all migrant workers and payment of wages through the bank, etc. The other countries in the middle East have also strengthened theirlabourlaws for protection of the workers’ human rights. These measures have tremendously improved the conditions of migrant workers. These are youth who venture on their own to find jobs abroad. They travel on tourists/visit visas and many of them fail to get the jobs before the expiry of their visas. Others run out of money and get stranded, send messages on social media and cause public anxiety. Due to lack of information about formal channels of getting employment abroad, many youths are lured by human traffickers, who smuggle the victims and end up in difficult situations in countries of destination. As a result of human trafficking and adventurism, the media portrays labourExternalisation as risky, dangerous and fake. 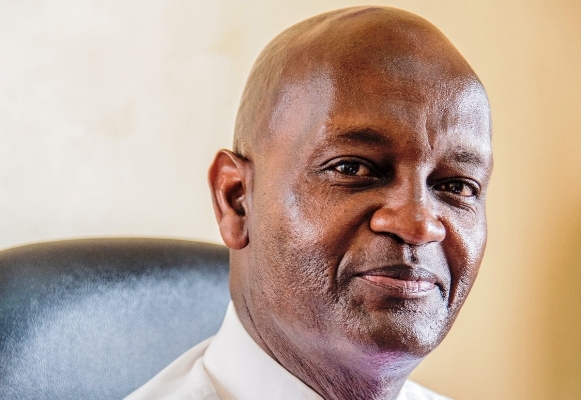 In order to mitigate the negative media reports, Uganda Association for External Recruitment agencies,(UAERA) has strengthened the Secretariat, with robust public relations programs to enlighten the public about the sector.However, we would appreciate support from the Media,different stake holders and the general population for continued sensitisation about this industry. We would like to urge opinion Leaderse.g, Politicians, Religious Leaders, Civil Society and the general public to always make a distinction between safe labour migration and trafficking in persons. Trafficked People carry the risk of going to the unknown, they may be mistreated, tortured etc. Whereas Workers who travel through genuine licensed Companies that are Members of UAERA, are captured in thedigitalized System, monitored and protected. Introduction of digitalization that has revolutionizedthe processes of recruitment and monitoring of workers from Uganda and inthedestination countries. Regulation and continued guidance about the industry. Establishment of a labourliaison office at the Uganda Embassy in Riyadh in Saudi Arabia that coordinates the monitoring process. All members of UAERA for their contributions in terms of Ideas and financial resources that fund UAERA programs. Our staff at UAERA Secretariat and Reception Centre for doing a fantastic job. Members of the Executive committee of UAERA for their tireless efforts in the stewardship of the Association. The Middle Eastern countries that offer employment to Ugandan Citizens. UAERA – Growthfrom 9 members in 2012 to the Current 110( One hundred Ten) is commendable. The Secretariat’s capacity has been enhanced and made effective. The Reception Center is located in Entebbe with competent staff who provide counseling services to deserving candidates. These are people who return home and found to be in distress, irrespective of how they left the Country, they get counseling services and relevant treatment at the facility before they re-settle back in society. To acquire a piece of land and construct a UAERA House. Transition from being tenants to landlords.UAERA’s Current address: BMK House Suite 402, Hotel Africana Complex. Build and establish a Vocational Institute to train our candidates in the various fields in conformity with the job market demands. Establish online professional services to serve foreign companies by application of Information Technology and provide employment to I.T graduates. We would appreciate support from the Government of Uganda, in form of a revolving fund for deserving candidates who pass interviews butfailto meet the cost of placement in countries like United Arab Emirates, Qatar and Bahrain.The fund would be administered by the Ministry of Gender Labour & Social Development. The Anti-Human Trafficking unit, under the Ministry of Internal Affairs out to be strengthened with more Manpower and logistics, in order to do more in curbing Human trafficking. On average 3,000,( Three thousand ) candidates are externalized to the Middle east every month.In our strategic Plan,the main focus is to improve on organisation, management and to continue streamlining the industry while working with bothMinistries of Gender, Labour and Social Development and Foreign Affairs, in order to achieve maximum safety and benefits for Ugandan workers abroad. Innovations introduced by the Ministry of Gender Labour and Social Development (MGLSD) have brought in a new impetus with more transparency and efficiency.The new mechanism has enhanced our capacity to navigate around challenges we faced in the past. Unemployment in the Developing world is real and hence the availability of candidates. The Industry is therefore, likely to thrive for decades to come. 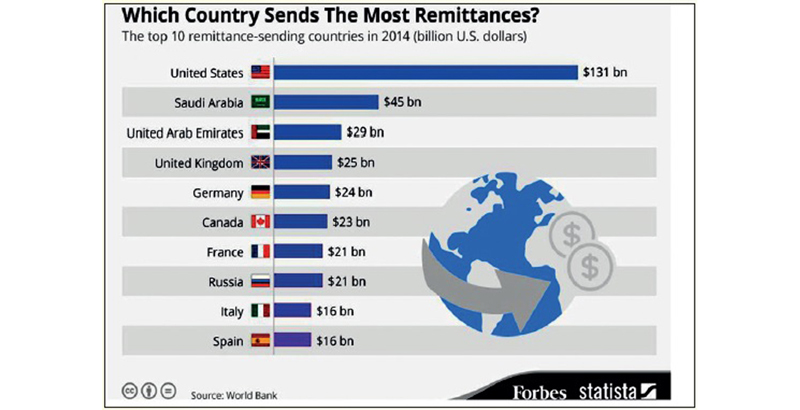 Let us embrace it and continue to rip the benefits.Uganda is not yet among the major players in this industry as indicated in Table-5of Remittancesabove.However, as we create more awareness within the Population,we shall continue to make progress. Uganda Association for External Recruitment Agencies (UAERA).